How fresh is this article? Through patent filings over the years, Google has explored many ways that it might use “freshness” as a ranking signal. 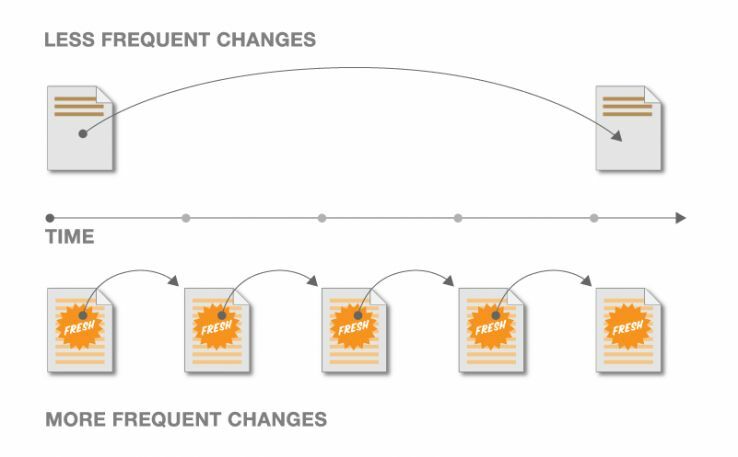 Back in 2011, we published a popular Moz Blog post about these “Freshness Factors” for SEO. Following our own advice, this is a brand new update of that article. In 2003, Google engineers filed a patent named Information retrieval based on historical data that shook the SEO world. The patent not only offered insight into the mind of Google engineers at the time, but also seemingly provided a roadmap for Google’s algorithm for years to come. In his series on the “10 most important search patents of all time,” Bill Slawski’s excellent writeup shows how this patent spawned an entire family of Google child patents–the latest from October 2011. This post doesn’t attempt to describe all the ways that Google may determine freshness to rank web pages, but instead focuses on areas we may most likely influence through SEO. Giant, great big caveat: Keep in mind that while multiple Google patent filings describe these techniques — often in great detail — we have no guarantee how Google uses them in its algorithm. While we can’t be 100% certain, evidence suggests that they use at least some, and possibly many, of these techniques to rank search results. For another take on these factors, I highly recommend reading Justin Briggs’ excellent article Methods for Evaluating Freshness. The implication is that Google measures all of your documents for freshness, then scores each page according to the type of search query. Search volume: Are queries for a particular term spiking (i.e. “Earthquake Los Angeles”)? News and blog coverage: If a number of news organizations start writing about the same subject, it’s likely a hot topic. While some queries need fresh content, other search queries may be better served by older content. 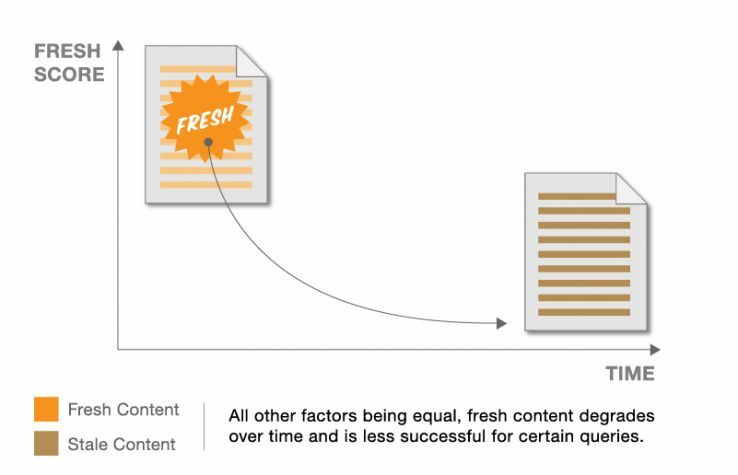 Below are ten ways Google may determine the freshness of your content. Images courtesy of my favorite graphic designer, Dawn Shepard. Initially, a web page can be given a “freshness” score based on its inception date, which decays over time. This freshness score may boost a piece of content for certain search queries, but degrades as the content becomes older. The inception date is often when Google first becomes aware of the document, such as when Googlebot first indexes a document or discovers a link to it. The age of a webpage or domain isn’t the only freshness factor. Search engines can score regularly updated content for freshness differently from content that doesn’t change. In this case, the amount of change on your webpage plays a role. For example, changing a single sentence won’t have as big of a freshness impact as a large change to the main body text. 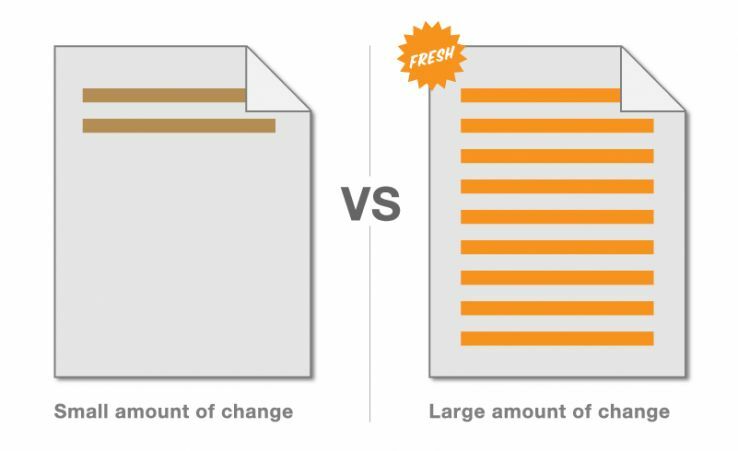 Changes made in “important” areas of a document will signal freshness differently than changes made in less important content. Conversely, “important” content often means the main body text. So simply changing out the links in your sidebar, or updating your footer copy, likely won’t be considered as a signal of freshness. This brings up the issue of timestamps on a page. 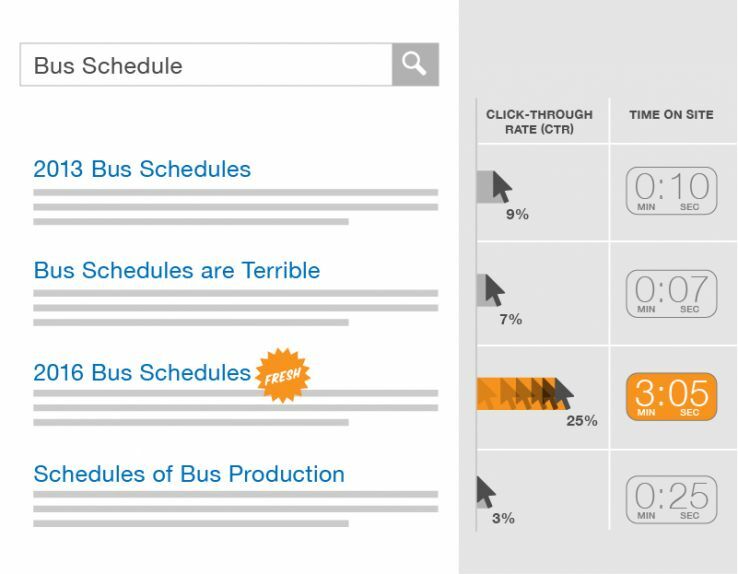 Some webmasters like to update timestamps regularly — sometimes in an attempt to fake freshness — but there exists conflicting evidence on how well this works. Suffice to say, the freshness signals are likely much stronger when you keep the actual page content itself fresh and updated. Content that changes more often is scored differently than content that only changes every few years. For example, consider the homepage of the New York Times, which updates every day and has a high degree of change. Google may treat links from these pages differently as well (more on this below.) For example, a fresh “link of the day” from the Yahoo homepage may be assigned less significance than a link that remains more permanently. 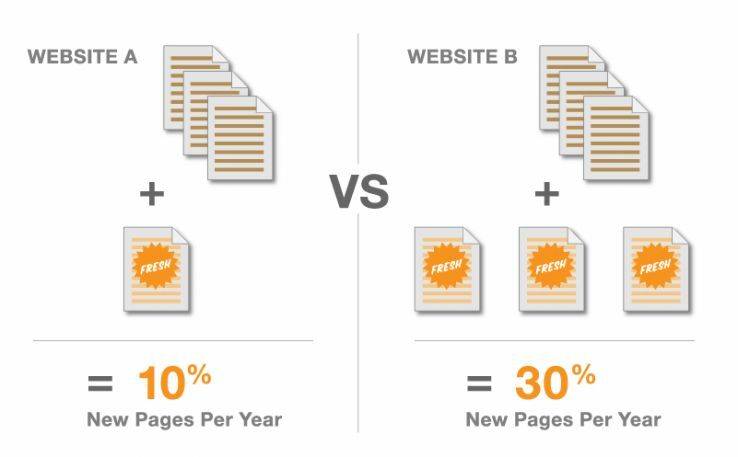 Instead of revising individual pages, fresh websites often add completely new pages over time. (This is the case with most blogs.) 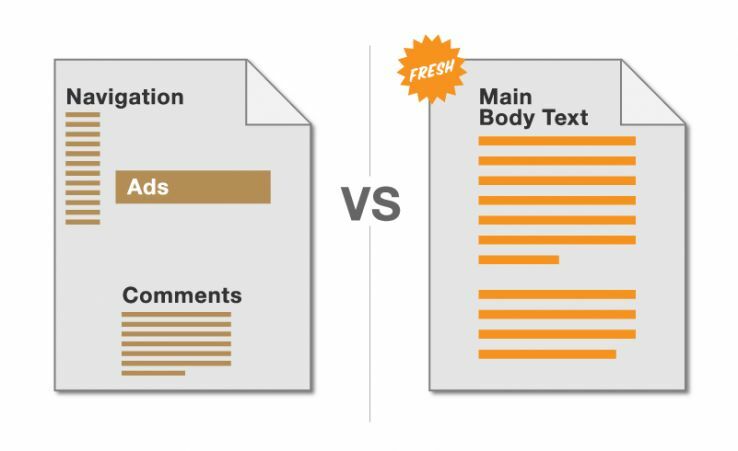 Websites that add new pages at a higher rate may earn a higher freshness score than sites that add content less frequently. Some webmasters advocate adding 20–30% new pages to your site every year. Personally, I don’t believe this is necessary as long as you send other freshness signals, including keeping your content up-to-date and regularly earning new links. Not all freshness signals are restricted to the page itself. Many external signals can also indicate freshness as well, oftentimes with powerful results. Be warned: an unusual increase in linking activity can also indicate spam or manipulative link building techniques. Search engines are likely to devalue such behavior. Natural link growth over time is usually the best bet. Links from sites that have a high freshness score themselves can raise the freshness score of the sites they link to. For example, if you obtain a link off an old, static site that hasn’t been updated in years, this may not pass the same level of freshness value as a link from a fresh page, i.e. the homepage of Wired. Justin Briggs coined this FreshRank. When Google presents a list of search results to users, the results the users choose and how much time they spend on each one can be used as an indicator of freshness and relevance. For example, if users consistently click a search result further down the list, and they spend much more time engaged with that page than the other results, this may mean the result is more fresh and relevant. You might interpret this to mean that click-through rate is a ranking factor, but that’s not necessarily the case. A more nuanced interpretation might say that the increased clicks tell Google there is a hot interest in the topic, and this page — and others like it — happen to match user intent. For a more detailed explanation of this CTR phenomenon, I highly recommend reading Eric Enge’s excellent article about CTR as a ranking factor. 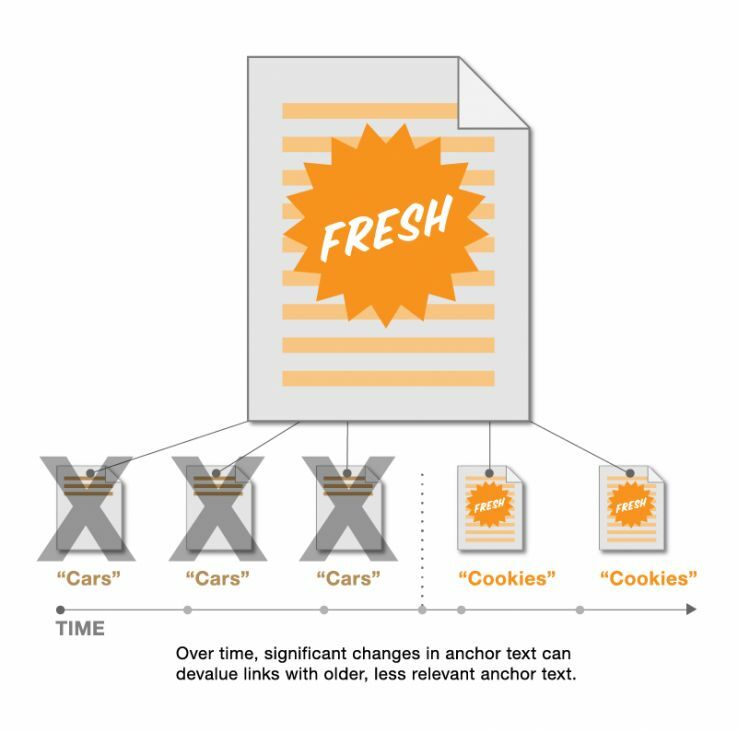 If the subject of a web page changes dramatically over time, it makes sense that any new anchor text pointing to the page will change as well. For example, if you buy a domain about racing cars, then change the format to content about baking, over time your new incoming anchor text will shift from cars to cookies. In this instance, Google might determine that your site has changed so much that the old anchor text is now stale (the opposite of fresh) and devalue those older links entirely. The lesson here is that if you update a page, don’t deviate too much from the original context or you may risk losing equity from your pre-existing links. Google understands the newest result isn’t always the best. 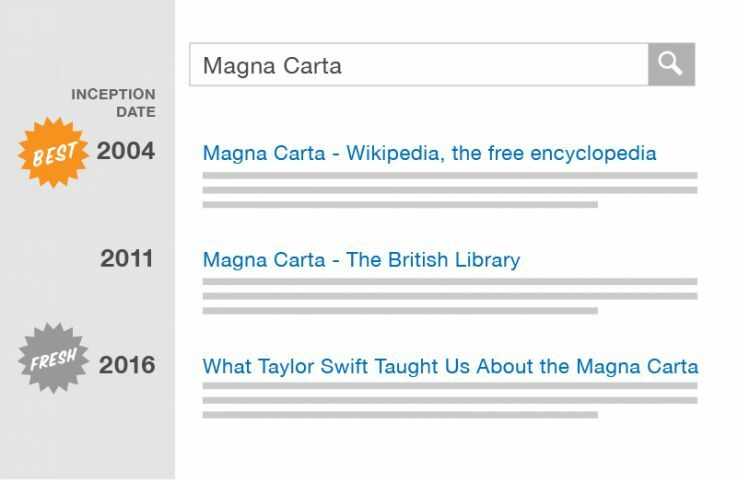 Consider a search query for “Magna Carta.” An older, authoritative result may be best here. In this case, having a well-aged document may actually help you. Google’s patent suggests they determine the freshness requirement for a query based on the average age of documents returned for the query. A good way to determine this is to simply Google your search term, and gauge the average inception age of the pages returned in the results. If they all appear more than a few years old, a brand-new fresh page may have a hard time competing. The goal here shouldn’t be to update your site simply for the sake of updating it and hoping for better ranking. If this is your practice, you’ll likely be frustrated with a lack of results. Instead, your goal should be to update your site in a timely manner that benefits users, with an aim of increasing clicks, user engagement, and fresh links. These are the clearest signals you can pass to Google to show that your site is fresh and deserving of high rankings. When updating, focus on core content, and not unimportant boilerplate material. Keep in mind that small changes may be ignored. If you’re going to update a link, you may consider updating all the text around the link. Steady link growth is almost always better than spiky, inconsistent link growth. 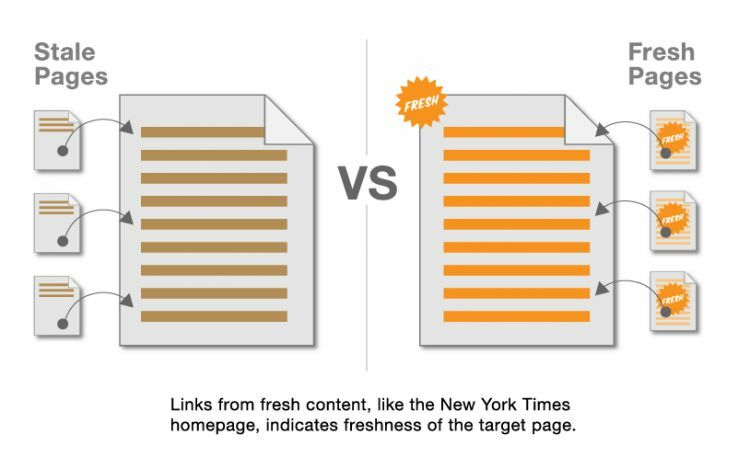 All other things being equal, links from fresher pages likely pass more value than links from stale pages. Engagement metrics are your friend. Work to increase clicks and user satisfaction. 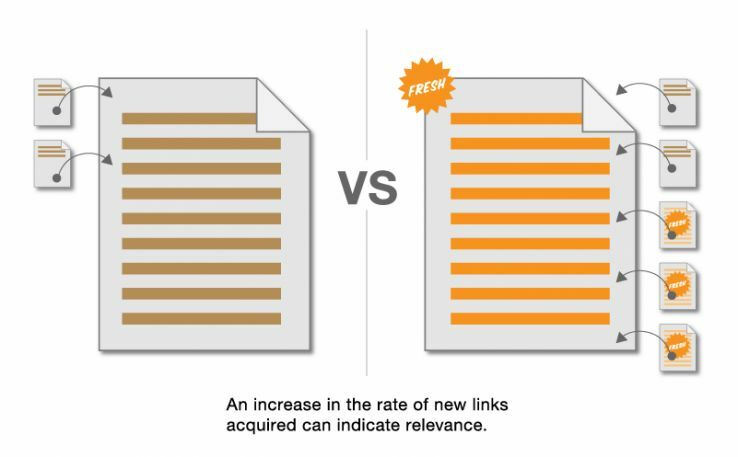 If you change the topic of a page too much, older links to the page may lose value.